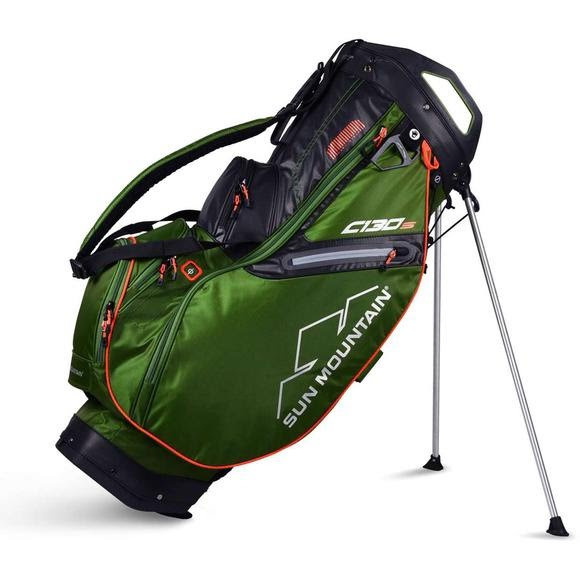 Adapted from Sun Mountain Sports' best-selling C-130 cart bag, the C-130S is designed primarily for cart use, with a stand system added for the range. Cart-friendly features include a leg-lock system, a cart strap tunnel which allows full pocket access when the bag is on a cart and a cart-friendly bottom that fits nicely in riding cart bag wells. Adapted from Sun Mountain Sports &apos; best-selling C-130 cart bag, the C-130S is designed primarily for cart use, with a stand system added for the range. Cart-friendly features include a leg-lock system, a cart strap tunnel which allows full pocket access when the bag is on a cart and a cart-friendly bottom that fits nicely in riding cart bag wells.